Gutterman 0125, originally uploaded by harmonweddings.com. 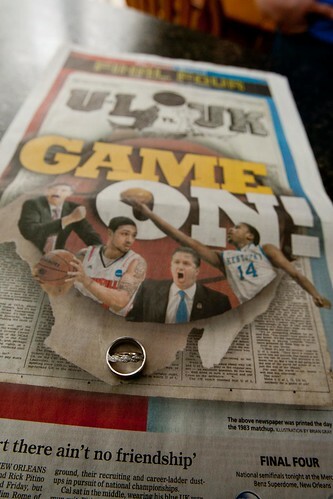 Yes, it just so worked out that Chad and Jessica's wedding fell on the NCAA Final 4 tournament game between UK and UofL. The couple leaned more toward UK, but it was all about the wedding between the two of them that was the overall winner of the day. There was playful banter throughout the day, but the guests really did rise above their fandom and cheered on the couple.